Between July 1830 and April 1882 one hundred men were admitted to the post of Military Knight of Windsor. Exactly one fifth of these men were veterans of the battle of Waterloo, the famous victory of the United Kingdom and its allies (the Netherlands, Hanover, Nassau, Brunswick and Prussia) over Napoleon Bonaparte’s French army, which celebrates its 200th anniversary this month. Among these twenty men, six were wounded during the course of the battle; one of them severely so. The unfortunate Captain Thomas Cradock, Military Knight from 1842 to 1851, is reported to have been shot through the nose. The Military Knights of Windsor could boast between them eight medals awarded as a result of their actions in the battle of Waterloo and its immediate aftermath. A number of those who eventually retired to Windsor had also played rather distinguished roles in the battle. Major George Frederick Berkeley St John (Military Knight 1865-66) acted as Orderly Officer to Lieutenant-General Sir Henry Clinton during the battle, meaning that on that day he was responsible for supervising all arrangements made for food and cleanliness in the Lieutenant-General’s regiment. Clinton was in command of the 2nd Division which included the 3rd British Brigade, the 1st King’s German Legion Brigade, the 3rd Hanoverian Brigade and two artillery batteries. These troops helped to defeat and pursue Napoleon’s Imperial Guard at the end of the battle. Major St John’s close contemporary Colonel Richard Blacklin, who was admitted as a Military Knight just two weeks after St John, had taken on a particularly brave role during the battle of Waterloo, carrying the King’s Colour after four officers had already been killed while carrying it during the battle. He himself went on to be one of the wounded. The King’s (or Queen’s) Colour is usually a version of a country’s national flag, often trimmed with gold fabric. Such flags are easily visible and identifiable and thus become a target for the enemy, so carrying them is a risky endeavour, as evidenced by the fate of Blacklin’s immediate predecessors. The subject of the portrait that is this month’s Image of the Month is Lieutenant George Sicker. Sicker was a Military Knight of Windsor from 1838 to 1848 and this portrait was taken in around 1838 when he was 71 years old. 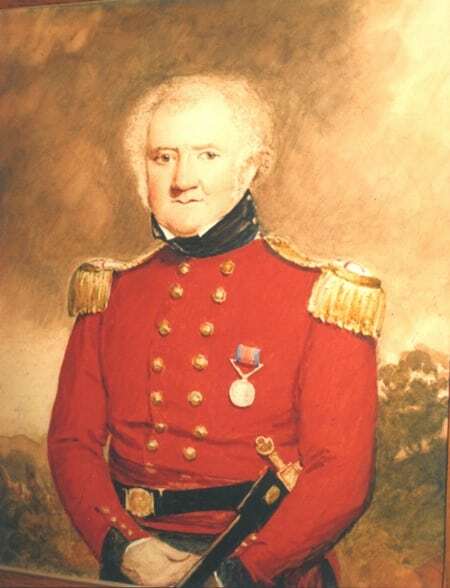 In it Sicker is shown wearing the dress uniform of a Military Knight of Windsor and the medal that he was awarded after the Battle of Waterloo. His regiment, the 11th Light Dragoons, for whom Sicker carried the regimental flag during the battle, was ordered to charge down the fleeing French troops. This they allegedly did with their sabres sheathed, out of humanity for their defeated opponents, and simply rode through the French soldiers before turning around and herding them back as prisoners. In his will, Lieutenant Sicker left his medals, his sword and the banner he had carried at Waterloo to Mr Roger Eykin, a former pupil of his who went on to be MP for Windsor from 1865 to 1871. In the 1950s efforts were made to trace Eykin’s descendants and have the medals, sword and banner returned to Windsor to be kept with the portrait, but they were sadly unsuccessful [SGC M.870/68]. Details of former Military Knights of Windsor can be found in volume 4 of the series of Historical Monographs relating to St George’s, The Military Knights of Windsor 1352-1944 (Windsor, 1944) by Edmund Fellowes and in the subsequently published The Military Knights of Windsor 1348 to 2011(Windsor, 2011) by Richard and Jennifer Moore.